이연희와 정용화가 드라마 '더 패키지'에서 안내자와 여행자로 조우한다. 낯선 방에서 창을 열고 마주한 풍경처럼 들뜨게 만드는 두 사람의 랑데부. 여자친구와의 갈등 때문에 혼자 파리행 비행기에 오르게 돼요. ‘다시 돌아갈까’ 하는 고민을 하면서도 밝은 캐릭터예요. 당장의 상황이 중요하지, 차였다고 주눅들거나 속앓이를 하지 않아요. 이제껏 연기했던 역할 중에서 제 성격과 가장 비슷해서 더 기대돼요. 절절하지 않은 분위기의 ‘사랑 빛’. 저는 그와 달라요. 슬플 땐 슬픈 음악을 들어요. 종종 해외투어를 하러 외국에 가지만 공연하는게 전부예요. 30시간이나 비행기를 타고 페루, 멕시코, 칠레에 가서도 제대로 둘러보지 못해 아쉬웠어요. 드라마 촬영을 하게 될 파리도 이번이 처음이에요. 소수만을 위한 프라이빗 섬이 있더라고요. 아무도 없는 그런 곳으로 여행 가보고 싶어요. 데뷔하고 나서 성격이 많이 바뀌었어요. 어릴 땐 친구들과 어울리느라 대부분 밖에서 시간을 보냈는데 지금은 집에 있는 게 좋아요. 몇 시간이고 소파에 가만히 앉아 있어요. 그러고 보니 제겐 소파가 프라이빗 섬이네요 (웃음). 씨엔블루 앨범의 절반이 그래요. 호텔 방에만 있어도 감성적이게 돼요. 창밖에 보이는 풍경부터 다르잖아요. 작업실이나 집에서는 느낄 수 없는 분위기가 느껴져 곡도 잘 써지는 것 같아요. 그래서 호텔 방에 가면 꼭 책상부터 앉아요. 호텔마다 느낌이 달라 늘 새롭게 시작하는 기분이 들어요. 다큐멘터리 느낌의 뮤직 드라마. 등장인물은 뮤지션이 전부고, 배경은 전망 좋은 호텔이죠 (웃음). 내용도 단출해요. 호텔 방에서 노래를 만드는 과정을 담는 거예요. 말하고 보니 이거 너무 지루하겠네요. 하하. 여전히 어려워요. 그렇지만 제가 먼저 나서서 분위기를 띄우려고 해요. 그래야 상대방도 저를 어려워하지 않을 수 있고, 결국 제 마음도 편해지게 돼요. 금방 친해질 것 같아요. 타지에서 촬영하는 데다 의지할 사람이 우리뿐이잖아요. 서로 지겨울 정도로 보지 않을까요 (웃음). 퓨전사극 ‘삼총사’. 액션 연기를 처음 해 봤고 조선시대에 잠시 살다 온 듯한 기분이 들었어요. 또 그 전까지 주로 어두운 느낌의 캐릭터를 연기했는데 제 성격처럼 한층 밝은 인물을 맡아 연기에 대한 부담감이 줄었어요. 개인적으로도 사람들에게 제 진짜 모습을 편하게 보여줄 수 있는 계기가 됐어요. 할 수 있는게 많을 거예요. 노래도 하고, 공연도 하고, 드라마 촬영을 하러 파리에 갈 수도 있어요. 할 수 있는 건 다 해본 것 같아요. 이제는 하고 있는 것들을 깊이있게 하고 싶어요. ‘잘한다’는 말 듣고 싶어요. Lee Yeonghee and Jung Yonghwa encounter each other as the guide and the traveller in drama ‘The Package’. Their rendezvous excites one’s heart like the view you see as you open the window of an exotic room. Q. What’s the story behind San Maru that you play in The Package? He boards the plane for Paris alone because of a conflict with his girlfriend. Though he ponders whether he will go back, he’s a lighthearted character. The present situation is more important to him than being despaired or having a heartache because he was dumped. I anticipate it all the more because he has the closest personality to mine among all the roles I’ve played so far. Q. What if you picked an OST for him among CNBLUE’s albums? “Love light” because it’s not doleful. I’m different from him though. When I’m sad, I listen to sad music. Q. Do you usually have opportunities to travel? Often, I go abroad for overseas tours but all I do is perform. It was such a shame I couldn’t really take a look around in Peru, Mexico, and Chile after 30 hours of flight. It’s also my first time going to Paris, where we’ll be filming the drama. There are private islands for very few travelers. I wanna travel to such a place where there’s no one. Q. Do you cope well with lone time? My personality changed a lot after debut. When I was little, I spent most of my time outside hanging out with friends. Now, I prefer staying at home. For hours, I’d just sit still on the sofa. I guess the sofa is my private island (laughs). Q. When you travel, unfamiliar things around you tend to become inspirations. Is there a song you made while performing abroad? Half of CNBLUE’s songs are written that way. Just being in the hotel room itself makes me emotional. The outside view is so different. The atmosphere feels different than the studio or my home, it makes it easier to write songs. When I go to hotel, I always sit at the desk first. Every hotel feels different, it’s like I’m starting anew each time. Q. If you were to make a drama about traveling, how would you do it? It’d be a documentary-like music drama. The only character is the musician, the setting is a hotel with a nice view (laughs). The story is simple. It’ll film the process of writing a song in a hotel room. Now that I think about it, it’d be too boring, haha. Q. Do you tend to get used to the new people and the new environment each time you’re in a new drama? I still find it difficult. But I try to enliven the atmosphere first. That way, those around me won’t feel uncomfortable around me, which in turn makes me comfortable. Q. How will it turn out this time? I think we’ll become friends quickly. We’ll be filming abroad, and we only have each other to depend on. We’ll see each other’s face to boredom (laughs). Q. For actors, playing a character is also an experience of living another life. Is there a drama that made you learn many things? The fusion historical drama, ‘The Three Musketeers’. It was my first time trying action, and it felt like I lived in the Chosun Dynasty for a while. Before, I used to play characters with gloomy personalities, but (Dalhyang) was much lighthearted, like I am. It lessened my burden in acting. Personally, it gave me an opportunity to be comfortable and show my real self to other people. Q. If someone else experienced Jung Yonghwa’s life, what will they enjoy? You’ll be able to do many things. You can sing, perform, go to Paris to film a drama. Q. What more do you wanna try? I think I’ve done all I could. Now, I want to have depth to what I’m doing already. I wanna hear that I’m good at them. Love this interview! His answers I feel has more loneliness tone to it! Maybe bcz of the type of questions asked. Him going places just performing & no time to explore , his preference for a hide away island ,, him calling his sofa his private island. He made it a joke but it made my heart ache! And him preferring to stay home than going out w/ friends like he used to. 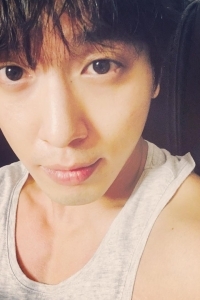 Ahh Yonghwayahhh maybe I'm just missing you . Love this glimpse on your psyche. Wish you always happiness & fulfillment in all you do. You have done everything & I'll be here always cheering you on as you now focus on polishing your self deeply into your craft. I know you'll do extremely well. No doubt about that. 용화씨를 다 알순없지만 정말 많은 노력을하며 사는 사람이구나를 다시 한번더 알게됐습니다. He talks about things lightly but we all understand that what he has experienced so far is not so easy! Sometimes we all need our own private island, a place that we can just be ourselves without anybody to disturb or judge us. Being a popular celebrity, YH must be feeling it even more. OTOH, it's quite sad that he apparently has quite a lonely lifestyle. I'm talking about being surrounded by people, media & fans but still feeling like you're in a lonely island. But it's just life; we all come to that realization sooner or later. The difference is that YH has been made to get there sooner due his circumstances & experiences which, I dare say, is not necessarily a bad thing. It will spare him from future disappointment & heartbreak. Thanks for the translation. I really miss YH. Thank you so much for the translation. Love the interview and his answers, gives some good insight of him. Maybe he now likes to spend time alone so that he can truely be who he is and let his hair down and relax. Being constantly in the media and stalked by fans must be tiring. Every interview brings some insights of Yonghwa's thoughts which it is a pleasure to find them! I like the childish side of him, but also the serious one- in fact I love his personality! Thanks for sharing!